SerraGlia is the alias of Lorenzo Servi, an Italian architect and visual designer/artist based in Helsinki, Finland. Through painting graffiti, SerraGlia first discovered cities and their untapped visual environment. Having finished a master’s in architecture (2008, University of Florence), he founded LUMART, an architectural visualization studio based in Helsinki. Parallel to his commissioned works, SerraGlia is constantly researching and analysing issues in everyday life and built environments, and using them as the basis for creating self-initiated projects documented through photography, video and publication. You can find more on http://www.serraglia.com or on Google. 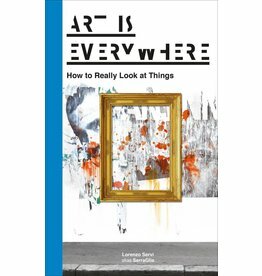 This book helps you to take a more careful look at your everyday life. The toolkit enables you to look and decode the world around you in a entirely fresh way. Observe the world like never before!